Lock in a great price for PJA - Santa Maria Youth Hostel - rated 8.7 by recent guests. Big parking place. Beautiful sea view near the hotel. Elizabeth and the other staff were very helpful and very friendly. I had a private room with my own bathroom and it was very comfortable. Good, basic hostel. Good location. Comfortable bed. Clean rooms. Friendly staff. Breakfast is ok. I would stay here again. Beautiful hotel. Amazing pool. Extremely clean. Very helpful staff. You can walk to and from the ferry. During my previous stay I commented that toast would be nice at breakfast. This trip I was delighted to see that a toaster had been introduced, so thanks for listening. A mirror in the room would be nice, saves taking up a space in the bathroom to do your make up. It might be an idea to advise guests if anyone else it expected in the evening. I arrived off the ferry late and disturbed a kid that was sleeping. She was appalled by this as thought she had the room to herself and checked out early the following morning! The property was very nice and the staff was wonderful. I arrived late and left early. My room was clean and nice and the property is located near the supermarket and restaurants in town. If I went back to Santa Maria, I would stay here again. Location is good, staff is helpful and friendly. Amazing outdoor pool! The stuff is really nice. It was really clean and the pool and the common space are really good. We stayed in a double room with private bathroom, was clean and comfy, i would say the room was large for 2 people. Beds were also comfortable. Nice common areas like TV room, internet room, and the pool was amazing with the ocean view. The bar is a huge plus, so cool that we could just chill there next to the water with a bottle of beer. The location is also satisfying, the bus stop is just next to the hotel, so you could reach out the ther parts of the island very easily. The receptionists were super supportive about the info on the island, Great experience we had there! 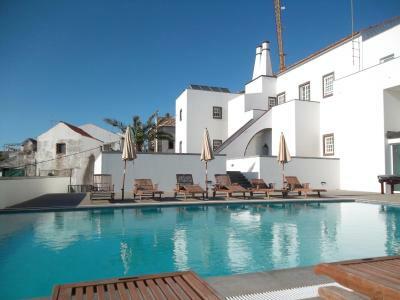 Offering a 24-hour reception and an outdoor swimming pool, Pousada de Juventude de Santa Maria is located in Vila do Porto centre, Santa Maria Island, Azores. The hostel is located a few steps from the port. Accommodations are shared and private and offer access to communal bathroom facilities with shower. Each room includes individual lockers. A standard breakfast buffet is included and served daily in the dining room, with swimming pool views. Guests can head to restaurants located within 1.2 miles to taste local delicacies. Pousada de Juventude de Santa Maria provides a car rental service and a shuttle service, upon request and an extra charge. Guests can explore the Aveiro Waterfall, with around 361 feet high, located in Maia, 13.7 miles away. Santa Maria Airport is located 2.5 miles away from Pousada de Juventude de Santa Maria. This property is also rated for the best value in Vila do Porto! Guests are getting more for their money when compared to other properties in this city. PJA - Santa Maria Youth Hostel has been welcoming Booking.com guests since 27 Jun 2013. When would you like to stay at PJA - Santa Maria Youth Hostel? Overlooking the Atlantic Ocean, this room includes individual lockers. Overlooking the Atlantic Ocean, this private room includes individual lockers. House rules PJA - Santa Maria Youth Hostel takes special requests - add in the next step! Bankcard PJA - Santa Maria Youth Hostel accepts these cards and reserves the right to temporarily hold an amount prior to arrival. PJA - Santa Maria Youth Hostel accepts these cards and reserves the right to temporarily hold an amount prior to arrival. Bed was not comfortable, no soundproofing which made it noisy with street noise and other guests. rooms could use an update. Great location, good facilities, we didn’t use the pool but it was beautiful. Very good staff. Breakfast was basic, they were able to store our luggage while we trekked around the island. Was clean. the only issue was that the room was in front of the road - which is not too busy, but the cobble-stones make allot of noise when even one car drives by. The staff had told me of the location of the room prior to arriving and when I asked about moving, I could have, but there are not private rooms with bathrooms located away from the road. Ear plugs helped... and this was only really a problem since I had to sleep early and get up very early for my work in the fishing port. I do not think this would necessarily be a problem for people on vacation or working but not needed to sleep early. Most of the rooms have a street view, and the noise from the street (vehicles on cobblestone) woke me up often at night. Ask for a pool view room. The lady providing breakfast seemed rather irritable and short with people, but did a good job (and a noisy one). The bathroom is not very convenient, as well as the kitchen. Plus, the kitchen can be used only during certain hours. The hostel is at the top of the hill, so was hard to get there with suitcases, next to the road ( no sidewalk) in the night. the wi-fi was not working in the room. No fresh veggies at breakfast ( I know, i am spoilt :D). The hostel is up the hill from the port which is convenient if you arrive late at night on the ferry. The view from the hostel are amazing. The place is clean and the staff are very friendly and helpful. A good breakfast is included in the price. Having a pool is an added bonus! There were clean towels every day and the breakfast was good.